Odense, Denmark – ROEQ is unveiling its TR500 Top Roller that automates load and unload operations of the MiR500, an autonomous mobile robot from Mobile Industrial Robots (MiR). 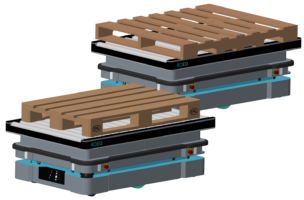 “A mobile robot without a conveyor or top module is like a robot arm without a gripper,” says Peder Grejsen, technical sales manager for ROEQ. The TR500 accommodates U.S. pallets and can be delivered with a fully automated lifter for pick-up and delivery of goods in heights ranging from 23.6 inches (600mm) to 29.5 inches (750mm). The Top Roller integrates with MiR’s user interface so that when the robot is called to deliver or pick up goods, the conveyor communicates with the pick-up and delivery stations and will automatically activate the loading or unloading upon arrival. “By targeting the loading and unloading of mobile robots, we are addressing that missing link in the automated logistics cycle that today is handled either by fork or pallet lifters or manually by employees,” says Grejsen. “Adding the conveyor capability strengthens the employees’ work environment by taking over ergonomically unfavorable tasks or by reducing truck traffic and noise. Representing ROEQ in the mid-Atlantic region is the Knotts Company, where sales manager Mark Howe sees a huge potential in outfitting MiR500s with conveyor functions. 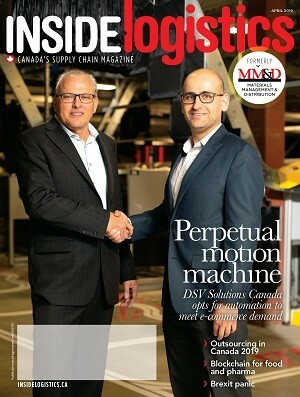 “Being able to handle 500 kg payload on mobile conveyors opens doors into new types of customers,” he says, mentioning material handling industries and distribution centres. The TR500 also eliminates the need for dedicated pallet stands adds Cale Harbour, vice-president of product marketing at Advanced Control Solutions, ROEQ’s distribution partner in the Southeastern U.S.